Jungle Ide “projects” is based on the concept of Solutions. A solution is a set of projects that conform a cohesive unit. As instance, a Solution can be a 3D rendering module, and a collection of samples that use this module. To understand this in a simpler way, we can think of a Solution as a list of projects. A solution can contain a single project, or as many projects as required. 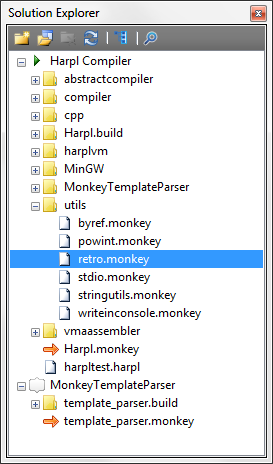 In this example, this solution has a project called “Harpl Compiler”, and also another one called “MonkeyTemplateParser” . Each one of this projects have their own monkey source code documents. 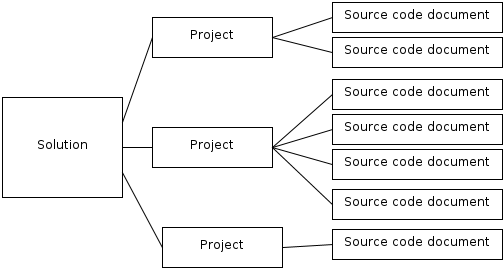 Each one of those projects generate an executable.